Rosie is just so wonderful, kind, smart, and beautiful! I just adore her! Rosie is making my life so fulfilled again. I think my beloved pugs, that have already gone ahead, really approve of her. Every little pug has such a different personality. Each one has something so special that we will always remember. I miss them so much, but Rosie is carrying on in their memory. 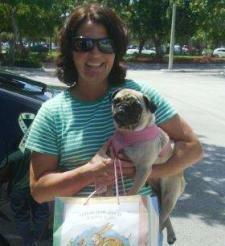 I am so blessed to have met her and Compassionate Pug Rescue. Thanks again for bringing us together!